Two adult dogs and three puppies are under the care of the ASPCA following cruelty arrests by the New York City Police Department (NYPD) in the Bronx. The officers were responding to a call reporting a domestic dispute, and when they arrived at the apartment, they noticed that the five pit bull mixes appeared malnourished and sick. The officers noted an absence of water dishes or food for the dogs within the apartment. Both residents were arrested and charged with animal cruelty. The ASPCA is caring for the dogs at our Animal Hospital and at one of our partner veterinary facilities, where they’re receiving medical treatment for malnourishment. It is too soon to discuss eventual adoption options. "This case clearly illustrates the impact that the NYPD-ASPCA partnership is having on the city's most vulnerable animals," said Howard Lawrence, Senior Director, ASPCA Anti-Cruelty Group. 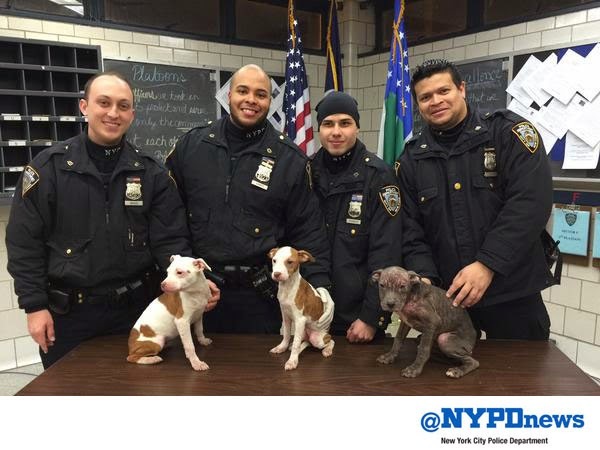 "While in the course of their normal duties, the Bronx officers were able to identify and stop animal suffering that might otherwise have never been reported." We encourage New York City residents to call 311 to report suspected animal abuse and to call 911 to report crimes in progress. Please visit our Fight Cruelty section to learn how to report animal cruelty in areas outside of New York City.